The visual system of the brain is extremely complicated and has a variety of mechanisms. Because of that, you can move your body without being aware of what you see, and by changing your way of seeing you can change your performance. In sports, people who take advantage of their vision’s various characteristics are able to win out. But how do they do it? One explanation lies in training in a varied environment. Vision for the purpose of movement is not fooled by illusion!? Kashino: Up to now, I have talked about the mechanisms and illusions of the visual system that generate bodily movements. Unfortunately, however, the story does not end here. I have to make the discussion even more complicated (laughs.) In fact, experimental results have shown that the vision that generates bodily movements is not fooled by illusions. The Ebbinghaus illusion is a well-known illusion. 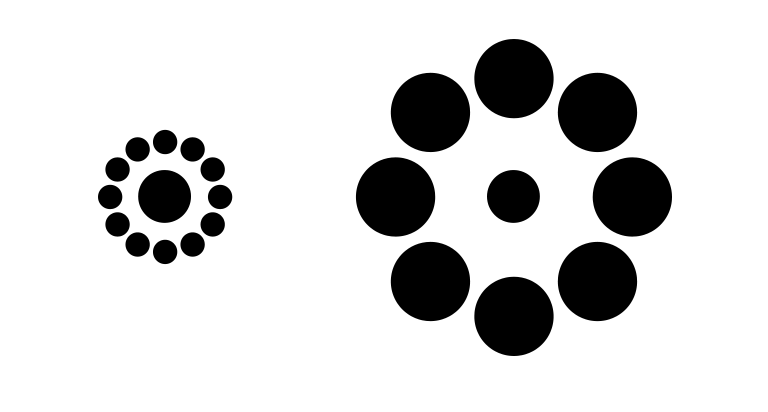 When you compare the two circles—one on the left and one on the right, we always take the circle on the left as larger, even though it is actually the same size as the circle on the right. However, if you try and pinch these circles with your fingertips, it is interesting that as you move your fingertips closer to the ball, you adjust the opening between your fingertips to match the size of the ball. In other words, you open your fingertips to the same distance for the circle on the left and the circle on the right. This means that the visual system for generating body movement is not affected by the illusion. So, what about the curve ball illusion we just talked about? When we get started on this, the discussion gets really complicated. In regard to the visual system that generates our consciousness of seeing something, the trajectory in the illusion looked bent; however, the visual system that generates bodily movements may not be controlled by illusions. Kashino: In other words, the body may not react as if it were conscious of seeing something. Here we still have a lot of room to do research. However, if a light is shown in the field of vision where a person with homonymous hemianopsia supposedly cannot see it, and this person was able to point to the light’s position with an off the wall guess or shot in the dark, then the person was able to point correctly. The same is true when the person says that a line is vertical or horizontal. Since this person has no awareness of seeing the ball or line, It is surprising that he was able to correctly point to the light or indicate the position of the line. Scientists have been doing much research on the neural mechanisms of blindsight, and, as I said before, it is thought that the pathway from the superior colliculus or the lateral geniculate body to the higher visual cortex is involved, bypassing V1. Thus, in the field of brain science, one by one pieces of evidence are emerging that indicate that the awareness of seeing an object move and responding to it with bodily motions are not necessarily connected. This is especially important in sports where a quick response is demanded. An interesting, yet unproved, possibility is that top athletes are able to develop exceptional implicit visual pathways that bypass V1. Even so, our research in this field is still just getting underway. From now by using virtual reality systems, we would like to investigate in more detail things such as how people react to rapidly pitched balls. In this way, even if we take just one thing, such as ‘seeing’, we see that a considerable amount of complicated processing takes place in the brain, and this processing is not something easily carried out. If we think about this, perhaps it may be more effective to throw slow balls faster than a certain speed in order to fool batters with changing pitches such as curveballs. —Indeed, if it takes time, then the visual system that generates consciousness will start to work and it will hit a snag, won't it? Well then, is a fast curve ball meaningless? Kashino: No, that is where it is useful. For example, in the major leagues there’s been a trend toward throwing ‘dirty balls,’ even for straight pitches. This happens when the pitcher slightly changes his hand’s grip on the ball and gives it an irregular rotation. When the pitcher does that, the ball goes almost completely straight, but just before it gets to the batter, it changes slightly. When that happens, it is too late for the batter to react, and so even if the batter hits the ball, he does not hit it with the barrel or sweet spot of the bat. A knuckle ball pitch is also difficult to hit because it is unsteady and hardly revolves at all. It curves irregularly and is difficult to predict. In this way, someone who knows and can use well the relationship in vision between the characteristics of illusions and physical movements will likely have an advantage in sports competitions. Kashino: By the way, it seems that our ancestors knew empirically the characteristics of visual experience. For example, one of the teachings of kendo is the phrase ‘Look at the mountains from a distance.’ This means that a person doing kendo should not stare at a single point, such as the tip of the opponent’s sword but instead should look at the whole scene—the body and background of the opponent, just as if he were looking at a distant mountain. In the same way, something similar is often said in baseball. Shinya Miyamoto, former shortstop of the Yakult Swallows has said that the secret of defense is the importance of looking generally and vaguely at the whole of the field. If we focus too much on the batter, we will be too late in reacting. There are also players who say ‘If you look intently at something, you create a gap,” meaning that your reaction becomes delayed. 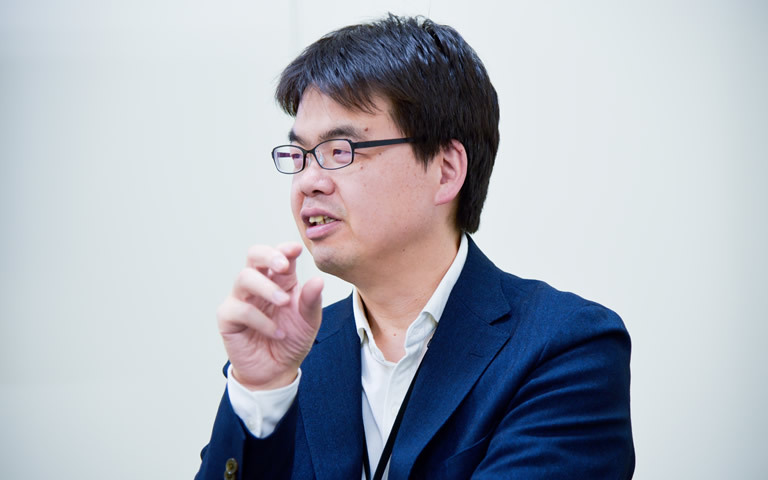 Actually, Dr. Hiroshi Ueda, one of the members of our project team, is just now doing research related to the concept of ‘Looking at the mountains from a distance’-- that is, just as in looking at mountains from a distance, it is important first to grasp the whole scene before looking at particular parts. One interesting thing is that, depending on the batter’s way of looking at the ball, the ball can be pitched at the same speed, but subjectively, the batter feels it sometimes as fast and sometimes as slow. If you look at the whole vaguely, movements appear to be slow. Well, then, how does this affect physical performance? I think we can further clarify this kind of thing in more detail by measuring and analyzing the line of sight of skilled athletes. To do so, we have to do more than just investigate the line of sight with eye cameras. Rather, we have to look at how we are able to grasp movements when we are not closely paying attention to what we see. I would like to develop a method for doing so. The reason is we have found that the more a skilled player practices the less his line of sight moves. However, this does not mean that in all cases we are fixing our attention on that one point. Information from the peripheral vision field is also important, isn’t it? Even in sports such as table tennis, the more amateur a person's skill is, the more the player tends to focus on following the ball; however, skilled players do not try to follow the ball constantly. If they try to do that, that will be exactly why they can’t keep up. —In the movie, The Matrix, there are scenes in which the hero, Neo, fires bullets and attacks his opponents. In these scenes, he comes to acquire skills in using weapons. As he does so, he shows an expression of enlightenment when he is able to shoot without looking at his opponents, and his ability to do so in exchanges with his opponents was impressive. I think he embodied well the movements and line of sight unique to experts. Kashino: That’s right: As you would expect, an expert shows no wasteful motions. The more one is an amateur, the more one carries out unnecessary motions. That’s because, the more you move, the more inexact becomes your control of your body. Actually, this can also be seen in the player’s eye movements. In a nutshell, there are various eye movements, but the ones we are particularly interested in are the micro saccades. In fact, if we look closely at our eyeballs, we can see that our eyes are not still, but moving-- they move quickly and slightly, about once every 1 or 2 seconds. These movements are micro saccades. 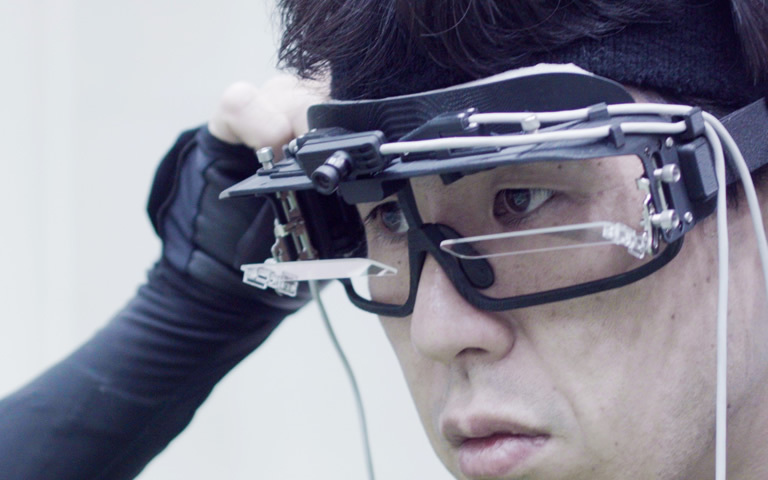 Mr. Makoto Yoneya, a member of our project team, is researching how to predict the internal condition of the brain from information that appears on the eyeball. He found that the control characteristics of the micro saccades change with the way in which persons pay attention to something. For example, we had participants in an experiment listen to a definite bleep-bleep rhythm, then suddenly this was interrupted by a “za” sound and when the rhythm patterns changed, the micro saccades became faster and they vibrated longer than usual. Even so, we are talking here about a difference of less than 0.01 seconds. When we pay attention to something, the control characteristics of the eyeball change, and micro saccades become slower and vibrate longer. What we have to be careful about when interpreting the data from an eye camera is that even if the line of sight is directed to a certain place, the object of attention can be in another position. You sometimes pretend not to see something, don’t you? Somehow, I want to use the control characteristics of this eyeball to make predictions. I definitely want to use these methods to investigate what skilled athletes are seeing, what they are paying attention to, and what their state of mind is. Kashino: In any case, many people are making efforts to improve their sports skill by training their eyes. In this regard, many people may be consciously doing too much. I think that the training necessary for a person to effectively use visual information around them should be done in a dynamic context instead. Thinking this way then, instead of training on an artificially prepared sports ground, athletes should train by running around outside, in the fields and mountains, where the environment is changing frequently. —The soccer player Shunsuke Nakamura has written how much of a hard time when he moved to the Italian Reggina club team because the grass surface of the pitch there was so bumpy. Kashino: Probably in any sport, the conditions of the Japanese environment and sports ground will be the cleanest. This is true in baseball, and one reason given, for example, about why Japanese infielders have been unable to play an active role in the major leagues is that they are used to the artificial turf in Japan and are unable to adapt to the natural grass of the ballpark fields in the major leagues. That’s because with natural grass it is easy for the ball to bounce irregularly, and the ball is difficult to predict, right? Isn't that also why players in Central and South America are strong in soccer? From early childhood, they acquire the ability to respond while playing on a poor pitch. The same is true with robots. We can make more robust robots when they have to learn in an environment that is rich in change and full of noisy data. Professional baseball players in Japan are used to playing in a clean environment. In addition, they are used to playing game with people who are similar to themselves. So, when they go overseas to play, they are often at a loss. Not only for major leaguers, but even for us amateurs a ball may come too slow for them to hit. (laughs.) On the other hand, when it comes to top athletes like Masumi Kuwata, they are able to adjust to any kind of environment or opponent. —In this project, you are trying to explain the difference in the brains of ordinary people and those of people who are top athletes, right? And you’re saying you want to find methods of learning the top athletes’ movements, right? Kashino: That’s right. However, there may be huge, almost unbridgeable differences between the two. Actually, with some people, even if they watch a virtual reality video that shows a fast ball flying towards their face, they do not react at all. There is a certain percentage of nonresponsive people. Normally, even though people know something is virtual, they will react-- their body falls down, they crouch, or even fall on their backside. —In that case, will it be difficult to acquire high-level skills through training? Kashino: That is just the research theme I want to investigate from now. If we can show that these skills can be acquired through training, that will be a phenomenal result. However, just as in language and music, we may find that there is a critical period in which acquisition becomes difficult after a certain age. However, even if it is difficult to acquire high level skills with normal training, I think that we will be able to acquire these skills to the extent that we can do a good job of stimulating implicit brain information processing. If we can establish new training methods, then this will be good news not only for people in the sports world, but for ordinary people as well.